PS My favorite fishnets (when I was a kid) were dark green. And they had a seam in the back. I was just too cool…and BTW I am geting my fermentation gear in order for that batch of hootch you are gonna tell us how to make. Last time I fermented beverages I had root beer all over the kitchen. I had root beer projectiles in my closet. It was wild. It was crazy. But I am going to give it another try! Oh, those fishnets sound PRECIOUS. You’re making cider with us? EXTREME FUN. Even when fermented stuff explodes, I’m secretly delighted. It’s like having a pet that just did something cool and unexpected. Like when our dog ate a Christmas angel and puked glitter. Oh my gosh you make me laugh….glitter puke. The root beer experience was nuts! First explosion woke us up, located the source. My bottles were blowing up! So, then, I had the great idea of taking the caps off and relieving the pressure. As soon as I cracked the cap, the bottle flew out of my hands, soared around the kitchen spewing root beer in its wake. (The cabinets and walls needed to be cleaned anyway.) Genny, would you believe that I could not locate the renegade bottle? Not until I decided to wash the curtains. It was laying on top of the curatain rod….crazy. wild. That is INSANE. And really, an awesome story that is totally worth whatever happened to your curtains. When glass beer bottles explode, it sounds like gunfire. Hilarity ensues! Kate, you’ve warmed my cold, black, little misfit heart! I’m so touched that I’ve been able to corrupt your life with my own brand of crazy. Thanks for your kind words and link…can’t wait to get you into more trouble with homemade hard cider! Hahahahaha! BTW I tasted a carrot this morning, the jalapeno is warming the veggies very nicely and I just love the oregano ….mmmm. It’s going to be a nice tasty batch. 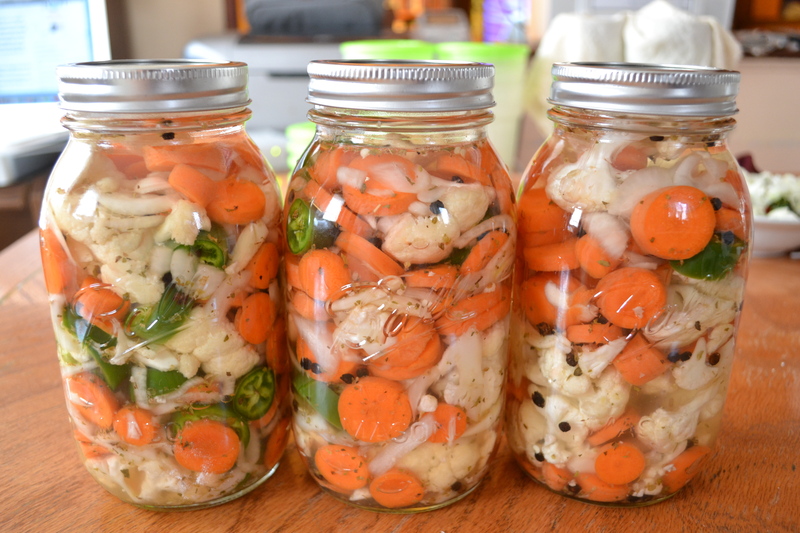 Just you wait ’til lactic acid fermentation makes everything nice and sour…NOM!